Three words. What. A. Game. 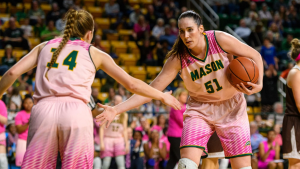 FAIRFAX, VA – This team continues to rewrite the record books, Mason Women’s Basketball (24-9) has just done something they have not done since their program started back in 1973. They pulled off their first win in the post-season Friday night against Stephen F. Austin (25-7) by a score of 82-75 in Round One of the WNIT. Three words. What. A. Game. The starting five had a substitution as Marika Korpinen made her first career start as a Mason Patriot. However, Jacy Bolton was mysteriously not dressed for the game despite being on the bench. Hopefully, she’ll be ready to go on Sunday. Natalie Butler finished the game with 20 points and 22 rebounds; and with that total, she continues her streak with now 32 consecutive double-doubles. This streak is now second all-time in NCAA Division 1 Women’s Basketball History and she’s not done. With her 22 rebounds, she now holds the all-time record for most rebounds in a single season in NCAA Division 1 Women’s Basketball History with 543. Wow. Nicole Cardaño-Hillary had a game-high of 28 points and 6 assists. Additionally, she was also perfect from the charity stripe going 12-12. Cardaño-Hillary came in clutch with some key three-pointers in the second half and lead the team despite taking a hard fall in the game. Tayler Dodson helped out with 14 points and 6 assists of her own. Mason went 50% (27-54) on overall field goals and 35% (6-17) from beyond the arch. Additionally, Mason out-rebounded SFA recording 45 rebounds to SFA’s 30. For the Lady Jacks, Chanell Hayes led Stephen F. Austin with 24 points including 6 three-pointers and Imani Johnson finished with 14 points. SFA made 17 3-pointers which, if I’m not mistaken, is the most that has ever been scored by an opponent at Eagle Bank Arena. SFA went 36% (26-71) on overall field goals and 37% (17-46) on 3-pointers. Mason played a great man-to-man defense by not allowing SFA to shoot in the paint and forced them to shoot threes. Natalie Butler held her ground, and Nicole Cardaño-Hillary did really well on defense keeping SFA on their toes. However, if we want to win this Sunday, we cannot have 24 turnovers as SFA took advantage, and scored 24 points off of those. The win tonight marks 11-straight home wins against non-conference teams for Mason. 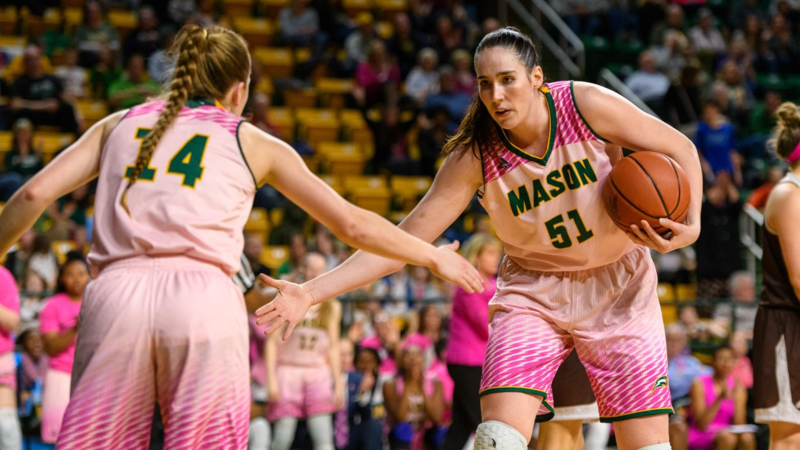 George Mason will face Virginia Tech on Sunday at 2pm in Blacksburg, VA.
Stay tuned for Sunday’s Preview vs. Virginia Tech on WGMU.